Originally published under the title "San Bernardino Terrorist's Mosque Cleric Exchanged ​38​ Texts With Terrorist, Claimed 'Casual' Relationship." Roshan Abbassi (left), the cleric serving as spokesman for the San Bernardino mosque where Syed Rizwan Farook (right, with wife Tashfeen Malik) worshiped, claims he barely knew Farook. But phone records indicate otherwise. The mosque at the centre of the San Bernardino terrorist attack is back in the spotlight after one of the organisation's clerics, Roshan Abbassi, was found to have had repeated contact with terrorist Syed Farook in the months before the deadly attack which left 14 people dead and 24 people injured. Mr. Abbassi and his fellow teachers at the mosque had previously claimed that they barely knew Mr. Farook, despite his repeat attendance at the Dar al Uloom al Islamiyyah mosque in San Bernardino. The mosque is now believed to be a haven for Tablighi Jamaat activists – a fundamentalist, proselytising Islamic sect known in some circles as the "Army of Darkness." 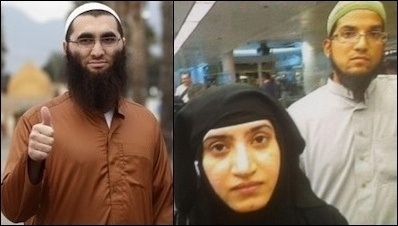 The New York Post reports that the Federal Bureau of Investigation (FBI) has found repeated phone contact between Mr. Abbassi and Mr. Farook, dating back to a two-week period in June – coinciding with the terrorist attack on two military sites in Chattanooga. Mr. Abbassi – when not dodging difficult questions from Breitbart News journalists – emphasised to reporters during a press conference held just two days after attacks that he only knew Mr. Farook very casually. He said at the time that he only exchanged pleasantries with Mr. Farook when they both attended the mosque. "Hello, goodbye, how are you... just casual conversation... nothing more than that," insisted Mr. Abbassi. But FBI agents are now investigating at least 38 messages that were allegedly exchanged between the pair during a two week span in June 2015. Mr. Abbassi was unusually hostile with reporters of all stripes when he was quizzed on radical Islam, FBI investigations, and his relationship with Mr. Farook on December 4th. When Breitbart News asked Mr. Abbassi whether he believed in an Islamic Caliphate, he refused to answer on multiple occasions. When asked at the time if the FBI was investigating anyone else at the mosque, he replied, "No comment," before giving reporters a wry smile. He was then asked to clarify, to which he replied, "No comment." After being pushed a third time, he responded brusquely: "You guys are our guests. If we have no comment, you cannot force us to have a comment thank you very much." And the stories between Mr. Abbassi and his fellow mosque leaders didn't stack up either. One claimed that Syed Farook hadn't attended the Dar al Uloom Islamiyah in a year, whereas Mr. Abbassi later revised this figure down to "a month." Radicalisation? Never. In Islam there is no such thing as a radical Islam. There's proof it was workplace anger. Proof. And everyone knows the argument that he got in with one of his people and why don't they ever tell us what the argument was about. It was later reported that the argument between a coworker and Mr. Farook may indeed have been about the State of Israel, and Islam. 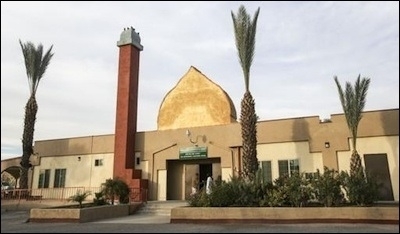 Speaking to other local imams, Breitbart News found a real fear of the Tablighi Jamaat sect, with one leader at the Corona-Norco mosque just a few miles away telling Breitbart reporters that the group was "dangerous" – especially for those who don't know what they are getting involved in when attending such mosques. "The Tablighi thing could get out of hand," he said. "[They] sleep in the mosque... they have... the beards," he dragged his hand further down his chin, widening his eyes. Now, U.S. government officials think there could be up to 50,000 Tablighi Jamaat members across the United States. Evidence from the United Kingdom, where the group practices aggressive tactics in their quest to build mega mosques across Britain suggests that security services and journalists may have ignored this ultra-orthodox sect – linked in numerous cases to terrorism – for too long. Assistant FBI Director Michael Heimbach has said: "We have significant presence of Tablighi Jamaat in the United States," adding that Al Qaeda has "used them for recruiting." Mr. Abbassi, who is of Pakistani origin, denies involvement in the San Bernardino terrorist attack, and has claimed that he was only discussing food donations for the mosque in his text exchanges with Mr. Farook. Tablighi Jamaat members across the world are encouraged to lead extremely austere lifestyles, with members often sleeping in their mosques, and only eating food that has been donated by other followers. Civil Rights and Civil Liberties shut the case down because we were focusing on individuals who belong to Tablighi Jamaat... This case actually took six years to develop... It started in 2006, and it gradually gained momentum over time. By 2008, I was interviewing twenty, thirty people a month sometimes. 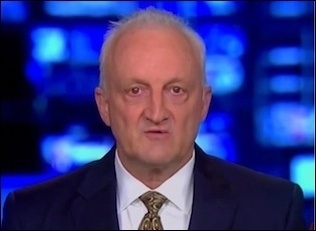 "It was exactly what DHS was created to do... We were doing what we took our oath of office to do. We were well-trained, capable subject matter experts, focused like a laser beam on a trend that was putting our country at threat." Earlier this month Breitbart London revealed that a family in Britain who claimed "Islamophobia" after being banned from the United States were too linked to the Tablighi Jamaat mosque in San Bernardino. Britain's security services have yet to comment on the suspicions surrounding the family. Michelle Moons is a journalist at Breitbart. Raheem Kassam is a Shillman-Ginsburg fellow at the Middle East Forum and editor-in-chief of Breitbart London.